The Shoutbox - A live chat board used to interact with other users and set up matches. 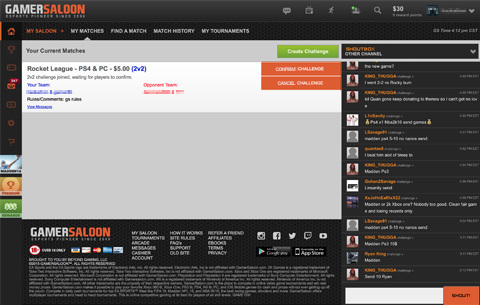 Find A Match - Shows all Online Players, Open Challenges and Tournaments. 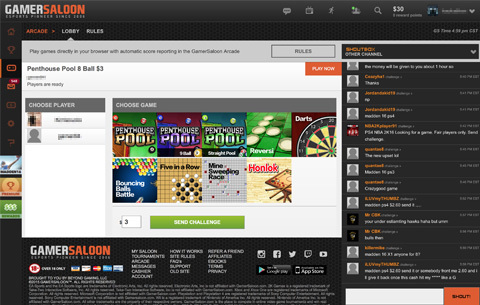 Challenges can be created from the My Saloon page, or sent from a players profile. 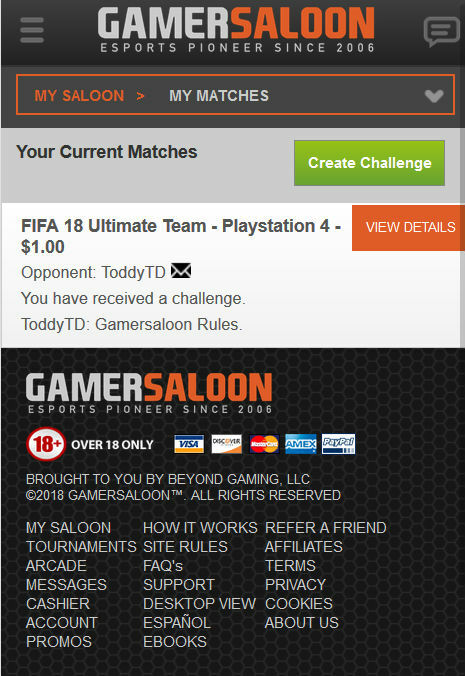 Anytime a player challenges you, the match details will be available under My Matches on the My Saloon page, by clicking View Details. Setting up a match is a three step process. Player A sends the challenge, Player B accepts the challenge, Player A then confirms the challenge was accepted and locks in the match. All match details as well as an individual chat window for the match are available under View Details on the My Saloon page. Team Challenges are similar to 1v1, but allow players to team up with other players and play against opposing teams. Winnings are distributed equally between teammates. 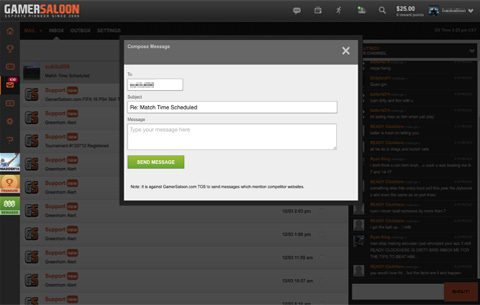 It is HIGHLY recommended that you message users prior to sending invites to a Team match. Start a Team challenge the same way you would send a normal challenge. You will see the option for diffent team sizes appear when you select a game title that supports team play. After selecting the team size, additional fields will appear. You must select a teammate(s) to create a Team challenge. When you create a Team challenge, your teammate(s) will first receive an invite to join your team. When your teammate(s) accepts the invite the challenge will then be sent to the opponent. 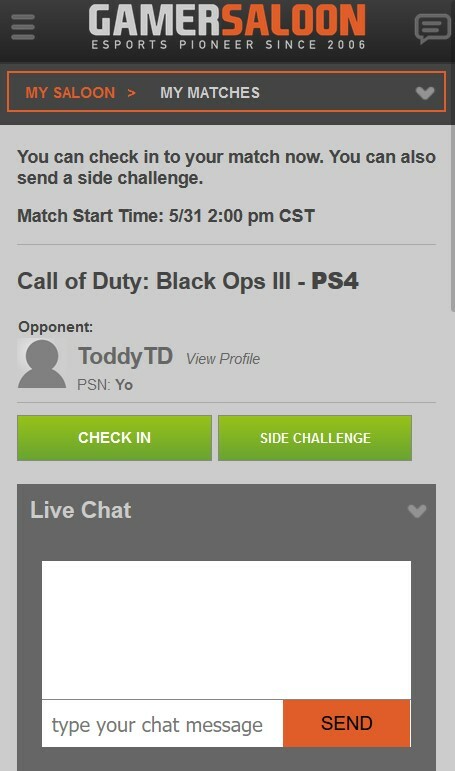 If a player sends you an invite to a Team challenge you will see it in your My Matches section. You have the option to accept or decline the invite. When you accept a Team team invite you will be able to type in private team comments to your teammate(s). 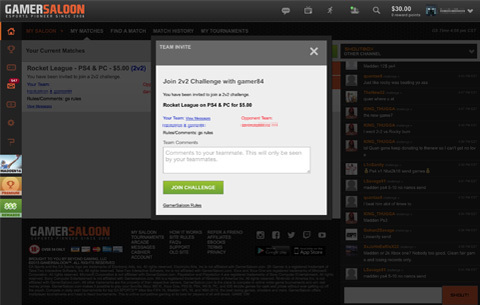 When all players have accepted invites, the challenge creator will then confirm and the Team match will be created. 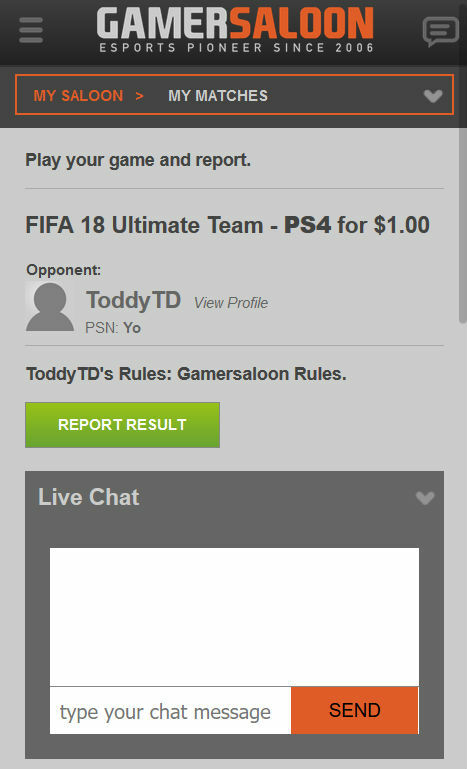 In a Team match the 2 team leaders will report and verify the results in the same way a 1v1 match is reported. 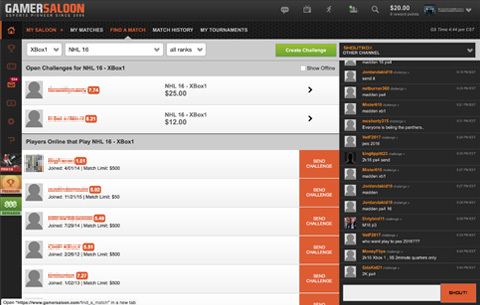 When the match is verified winnings will be automatically be distributed to the winning team members. 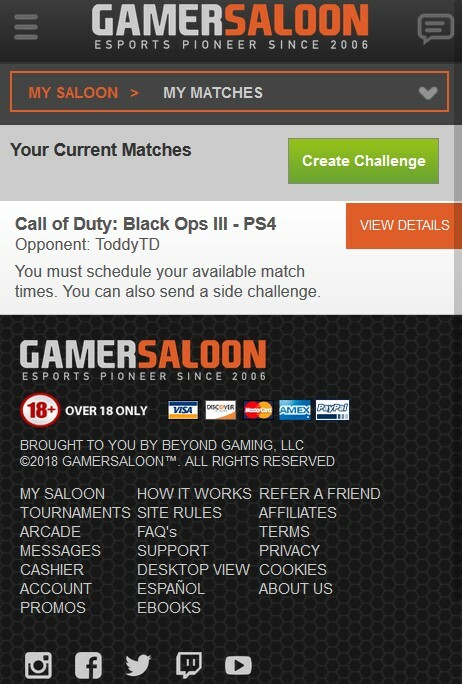 You can post your available times under My Matches on the My Saloon page. You have 24 hours from the time each round is posted to submit the times you are available to play. Failure to post the times that you are available to play within 24 hours of a round launching will result in an automatic forfeit. Once a match is scheduled you will need to log on to GamerSaloon.com, click Check-In, and be ready to play the match. The Check In option will be available in the View Details window for your match located on the My Saloon page. Players are able to check in 30 minutes prior to the scheduled match time and up to 45 minutes after the scheduled match time. Failure to check in and be ready to play within 45 minutes of the scheduled match time results in an automatic forfeit. At any time both you and your opponent are logged on to the site, you and your opponent will have the option to play the match by clicking Play Now. 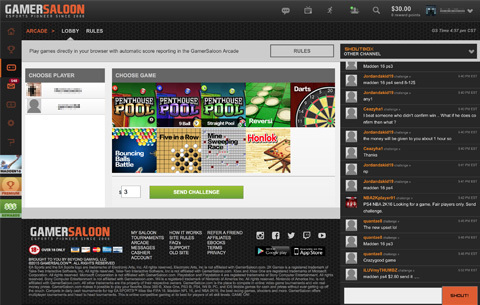 The Play Now option will be posted in the View Details window for your match located on the My Saloon page. If you both click Play now there is no longer a scheduled match time, there is no longer a deadline to enforce and if the match is not played by the time the round has to be advanced because of time restrictions, the player that made themself more available to play, will be advanced. 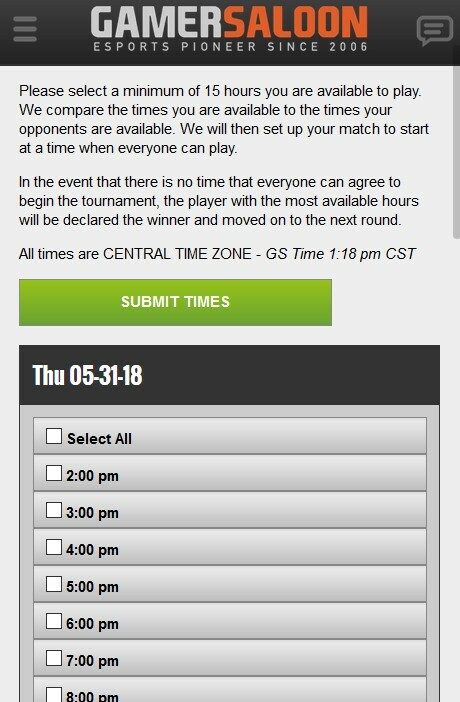 If both players post the times they can be available to play and none of those times match, a match time will not be scheduled. 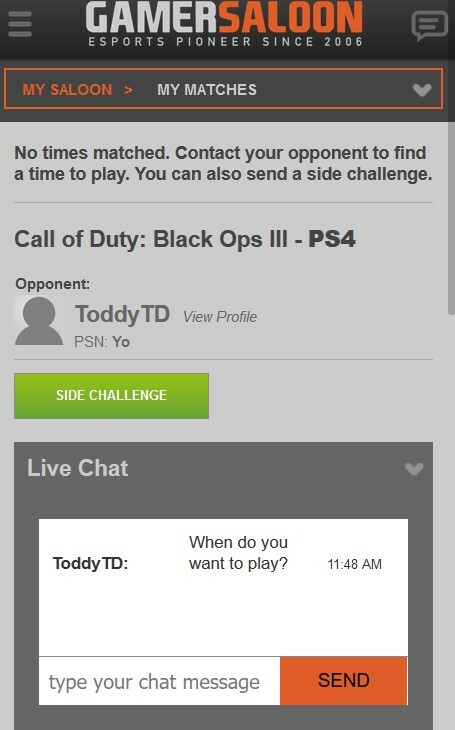 You will then want to contact your opponent through the live chat window for your match and attempt to play. If the match is not played by the time the round has to be advanced because of time restrictions, the player that made themself more available to play, will be advanced. Join the tournament and send invites to your teammates directly from the registration page. YOUR SPOT IS NOT RESERVED UNTIL ALL OF YOUR TEAMMATES HAVE ACCEPTED THEIR INVITE AND THE TEAM IS FILLED! Invites can be accepted via the internal message that is received when the captain sends the invite or directly on the MySaloon page. The moment each round launches, you will receive an internal message and email informing you of your opponent as well as how to proceed. As soon as a round is launched, captains are given the option to post the times their team can be available to play through the duration of the round. Once both team captains post their available times, a match time will be set and each player will be notified. Failure to post your teams' available times within 24 hours of a round launching results in an automatic forfeit. Team captains will need to log on to Gamersaloon.com and check in. The option to check in is posted under My Matches on the My Saloon page. Team captains are able to check in 30 minutes prior to the scheduled match time to 45 minutes after. Failure to check in and be ready to play within 45 minutes of the scheduled match time results in an automatic forfeit. Team captains are responsible for rounding up their team and exchanging gamer tags or personas when the game is ready to be played. 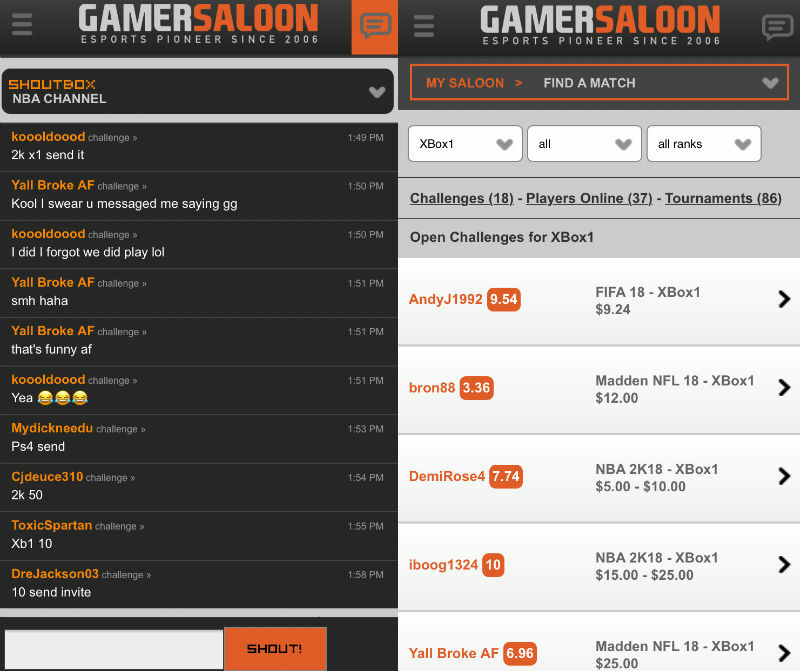 The GamerSaloon internal message system is the easiest way to initiate contact with your opponents and most players gamer tags or personas are posted on their GamerSaloon profiles. Upon completion of the match, captains will report the results under My Matches on the My Saloon page. 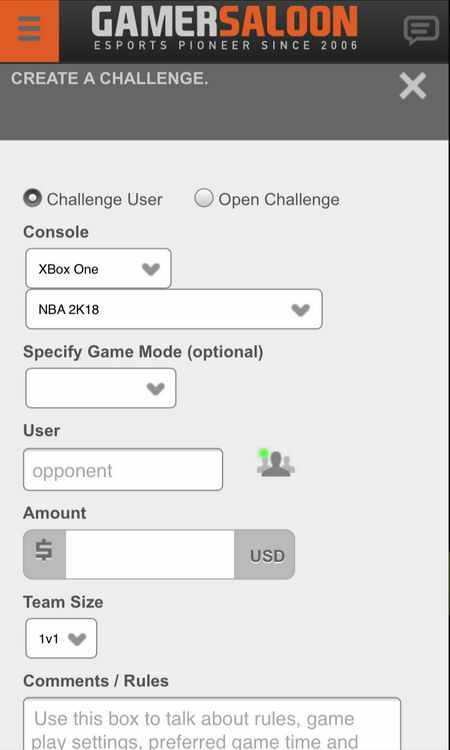 To send a challenge select a game, a player, an amount, and click send. 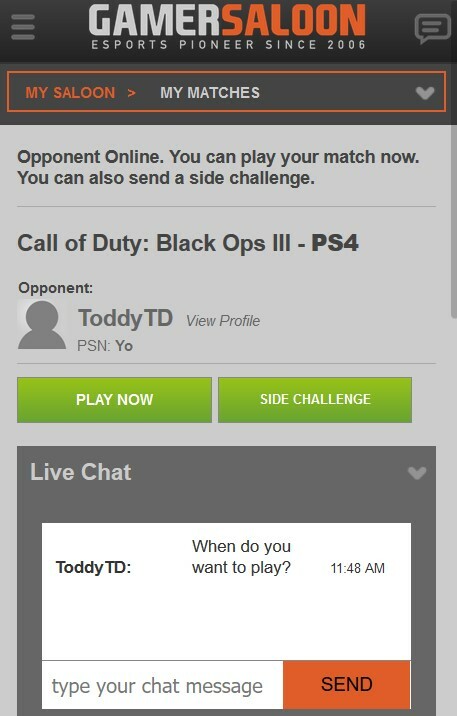 Anytime a player challenges you the match details as well as the option to accept or decline the challenge will be posted under Current Challenges. 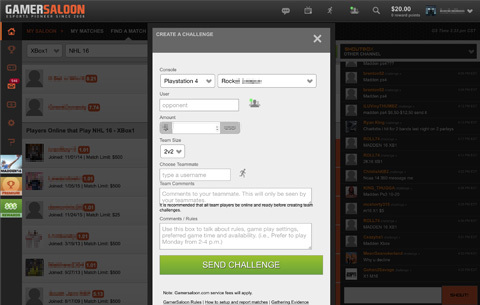 When a match is ready to be played the Play Now option will be posted under the Current Challenges section. Once you hit the button the game window will be brought up. Minesweep, Darts, Ball Battle, Beer Pong and Pool within 15 minutes. 5 in a row, Checkers, and Reversi within 30 minutes. If you close the window at any time while in game you will forfeit. If your Internet connection drops and results in a disconnection, you will forfeit. Keep this in mind if you play on a WiFi connection that is prone to resetting or a shared connection that has high use. If you experience a technical issue of any kind you will need to provide documented evidence (i.e., screen shots, photos) in order for your claim to be reviewed. If you have a claim and provide no evidence your claim will not be valid and the verified results will be final.